Download "Assessment of Workshop Facilities Management Practices in Technical Colleges of Niger State"
5 International Journal of Scientific and Research Publications, Volume 4, Issue 7, July N 1 and N 2 = No of Technical Teachers and Analysis in Table 4 revealed that the respondents agree with all items as the mechanisms that should be adopted in the management of workshop facilities in technical colleges V. FINDING AND DISCUSSION The findings as contained in table 1 revealed that respondents disagree with all the items as workshop management practices adopted in the planning of training facilities in technical colleges. This in consonance with the views of Jojoh (2006) who explained that improper planning lead to failure in any organisation. He further stressed that improper planning of the workshop facilities results in wastages as well as poor management of human and resources. The researcher is of the opinion that planning of the workshop facilities should depends very much on what a workshop is design for and should further be determined by the type of tools, equipment and number of students required there at a time. Effective planning of workshop facilities determines the achievement of learning objectives (Aromolaran, 2000). In Table 2 findings revealed that the respondents disagree with all the items as workshop management practices adopted for the storage of available training facilities in technical colleges. This is in-line with the findings of Ekah (1998) who asserted that most technical colleges lack storage room in the workshop where consumable items and working tools can be safely stored. Hakha (2008) in support of this finding also noted that racks and boxes for tools storage are not available in most technical colleges there by rendering the available tools in effective for practical purposes. The researcher is of the view that good housekeeping such as effective tool inventory system and involvement of technical teachers which will in turn lead to proper storage and management of materials and tools for easy reach of students are generally absent in most technical colleges. Findings in Table 3 revealed the views of respondents on the items as workshop management practices adopted in the maintenance of training facilities in technical colleges. The findings revealed that lubricants such as oil and grease are usually available in the workshop this corroborate with the views of Dabban and Abbas (2000) who opined that periodic oiling of machines reduces the wear of moving parts and prolong the life span of the equipment. The findings further revealed that there is no planned maintenance policy in the workshop for equipment maintenance this is in line with the views of Doyin (2004) who opined that lack of planned maintenance policy affect the facilities in the workshop which according to him in turn affect the teaching and learning of technical courses. However, the researcher is of the view that there is need to provide well organize and complete maintenance instructions with periodic inspections that will assist in determining the type of maintenance to be adopted in the workshop. Analysis in Table 4 revealed that the respondents agree with all items as the mechanisms that should be adopted in the management of workshop facilities in technical colleges. This in consonance with Umar (2008) who stressed on measures for maitaning discipline in the industry outlined some methods which includes drawing a code of conduct, provision for better condition of service and more broad minded policy. However, Okorie (2000) emphasizing on the security of equipment in work endowment stressed that machines should be fixed on the floor in order to be firm and also serve as a security mechanism. Abdullahi (1994) also maintained that workshop and conferences should be organized for teachers and workshop personnel in order to update their skills in their respective discipline. Well the researcher as this point is of the opinion that these mechanisms is well implemented would improve the effective management of technical colleges workshop as well as the facilities which will in turn lead to improved skills acquisition in technical colleges. VI. CONCLUSION This study has identified some evident and thus formed the following conclusion: the objectives of vocational and technical education programme are not completely achieved as a results of improper planning of teaching facilities, lack of proper storage for available training facilities, lack of effective maintenance for training facilities as well as in effective mechanisms for proper management of workshop facilities in technical colleges.. Accordingly, if the findings of this study are effectively utilized a batch of highly and skilled technical colleges graduate will be produced. VII. RECOMMENDATIONS Based on the findings, the following recommendations were made: 1. Technical teachers should be allowed to participate in the planning of the workshop facilities. 2. Workshop facilities should be stored according to their characteristics. 3. Preventive maintenance should be observed regularly. 4. Adequate security should be provided for the workshop facilities. 5. Workshop personnel with good and training habit should be employed. REFERENCES  Abdulkadir, M. (2011). Assessment of teaching-learning practices in practical motor vehicle mechanics work at technical college level in Niger State, Nigeria. Unpublished M. Tech thesis. Federal University of Technology, Minna. Abdullahi S.M. (1994) Strategies for improving female participation in technical education in kano State. Unpublished M.ed thesis. Department of Vocational Teacher Education. University of Nigeria, Nsukka,  Aromolaran, E.A. (2000) Fundamental of management. Shomolu. Lagos: BVL print Technologies. Boyi, J. (2008) Improving vocational Education: Daily Trust Newspaper 5th October, 2008. 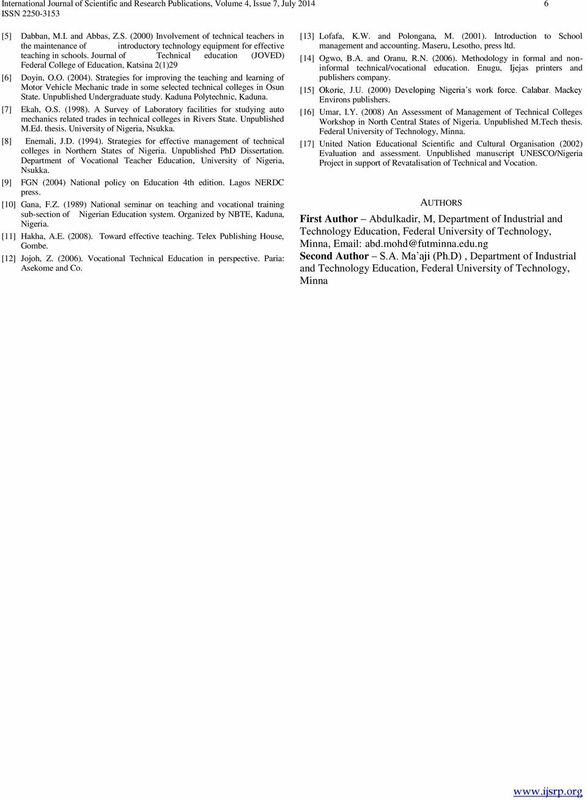 OVERVIEW ON THE BENCHMARK MINIMUM ACADEMIC STANDARD FOR ENGINEERING QUALIFICATIONS IN NIGERIA ABSTRACT By J. A. OLORUNMAIYE Department of Mechanical Engineering, University of Ilorin, Ilorin. Nigeria.